Emiliano Sala’s sister led tributes to her brother as Mesut Ozil, Dejan Lovren and Kylian Mbappe all penned heartfelt messages for Cardiff City striker Sala. The Cardiff striker’s body was found in the plane wreckage in the English Channel, police have confirmed. Sala’s sister Romina posted a picture stood on the pitch at Nantes, arms out either side as he looked up to the sky. Her emotional tribute to her brother said: Your soul in my soul will shine forever, illuminating the time of my existence. I love you’. Liverpool defender Dejan Lovren posted a heartfelt message on Instagram saying: ‘I prayed every day because hope is the last. This is a great deal to accept. Arsenal midfielder Mesut Ozil said: ‘No words to describe how sad this is. Chelsea defender Antonio Rudiger said: ‘Heartbreaking to hear the news about Emiliano Sala. Rest in peace! Manchester City forward Sergio Aguero added: ‘Terribly sad. Rest in peace, Emiliano. My condolences to his friends and family. 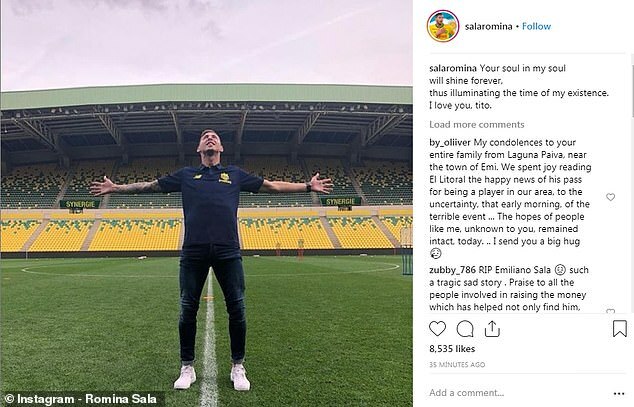 Mbappe, Antonio Valencia and Ruben Loftus-Cheek all posted ‘RIP’ on social media in tribute to Sala. Families of the Argentine striker and pilot David Ibbotson had been anxiously awaiting news over whose body was pulled from the crashed Piper Malibu plane as they seek answers over the tragedy last month.